Last week, Ford Motor Company announced plans to introduce a smaller off-road SUV that will accompany the 2020 Ford Bronco. The automaker issued a shadowy picture of that new small SUV while talking about the Bronco and a couple other new SUVs that will arrive in the next few years. 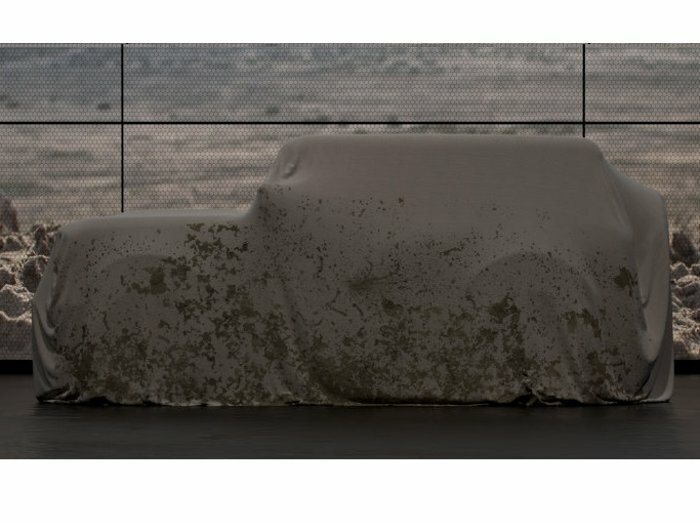 All of the discussion over Ford’s plans to introduce several new SUVs has caused some confusion in the world of social media, but the image above is the only official FoMoCo image of the new Bronco. This image didn’t come with any details, but this is technically our first – and best – look at the 2020 Ford Bronco. Unfortunately, it is covered, but that tight sheet allows us to see the topline of the vehicle. As expected, the 2020 Bronco has similar bold, upright lines to the concept vehicle that debuted a few years back. It has a long, flat hood, a short windshield with a sharp upright angle, a long, flat roof line and a steep downward angle to the rear glass with what looks to be a spare tire mounted out back. This Bronco also appears to have a very upright grille, along with prominent wheel arches that are high enough from the ground to provide plenty of space for huge off-road tires. In many ways, the Bronco under the cover is shaped a great deal like the Wrangler, which is fitting, considering that the new off-roading Ford will look to bust in on the sub-segment that Jeep has dominated for decades. What we know for sure about the 2020 Ford Bronco is a fairly short list, but it will be built in Michigan alongside the 2019 Ranger. It will also share a chassis platform with the Ranger and it is likely to share drivetrain components as well. A V8 would be a nice (and unlikely) surprise, but we can expect an array of EcoBoost 4- and 6-cylinder engines, some of which are likely to be mated with the new 10-speed automatic transmission. Finally, there are rumors that the 2020 Bronco will have solid front and rear axles, which would make for a far more capable off-road machine, but there is no concrete evidence of that. With the new Ford Bronco set to arrive for the 2020 model year, it is likely to hit dealerships sometime in the middle of 2019. With that in mind, it is likely to make its formal auto show debut either late this year or early next year. I would say it is going to be similar to the Troller T4. This is a Brazilian auto maker that the Ford company purchased a few years ago. They will produce these to compete with the Jeep. I hope they make it in a 4 dr variant as well.